Funky Worthless: X? In *my* Y? Putting the "F-U" in "Funky Winkerbean." Once upon a time, the comic strip "Funky Winkerbean" was a pleasant little daily funnie about a high school and their band director. Now it has become a veritable "soap opera" strip, akin to such two-panel wonders as "Mary Worth" and "Rex Morgan, MD." In fact, the nature of the comics are so similar that when the dialog is swapped between any given comic strip of the soap opera genre and any given recent "Funky Winkerbean" strip, the change in quality and context is virtually unnoticeable. In short, I take a strip from something like "Mary Worth" or "Rex Morgan MD" and swap its dialog with the dialog from a "Funky Winkerbean" strip, demonstrating how little difference there is between the two. Observe. thanks to a Comics Curmudgeon commenter who brought this up. 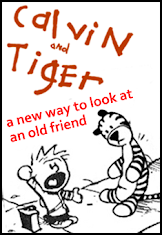 see my other comics blog, "Calvin and Tiger"
Funky Worthless. Copyright © 2009 www.dantearaujo.net. Designed by Dante Araujo. Edited by Emily K.